The Cameras – John's Cameras. I started collecting cameras when I saw a folding Franka Solida II for £20 in the window of London Camera exchange. It so happened tyhat I had £20 burning a hole in my pocket so I went in and bought it. I spent a very enjoyable afternoon with my ‘new’ camera taking photographs of Lincoln – 16 of them on my first roll of film for ten years. I had learnt the basics of apertures and shutter speeds many years previously and it all came back to me fairly quickly. Learning the idiosyncrasities of the camera took longer – no manual was avilable – and I wasted a shot or two (or three) using the wrong red window to advance the film and fighting the double exposure lock. The single old camera turned into a collection when I sold my old vinyl record collection on Ebay. Every time I logged on to Ebay, it would suggest things I could buy – and some were cameras. So, every couple of weeks I bought another camera. I had no rhyme or reason about my collecting. I just bought anything that caught my eye. After six months or so, I decided that I needed to rationalise my collecting so I decided on two themes. First, cameras from the first half of the 20th century that were iconic of their time. Secondly, 35 mm cameras from the second half of the 20th century that were made for serious(ish) photographers. Later, I added a third theme – professional and semi-professional cameras. I am keeping my collection at around 50 cameras, so as I buy more, I sell those that are no longer appealing to me as much as when I bought them. My first theme is almost entirely medium format (120 film) cameras with (currently) one 35 mm camera, the Tenax I. Those lookmold with much lose of paint and corrosion of metal parts. 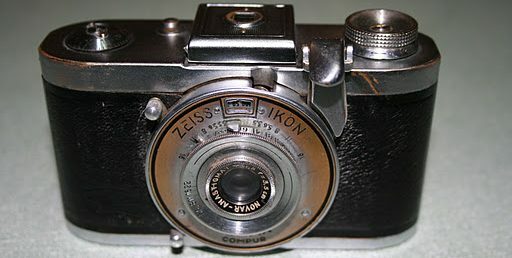 My second theme revolves around Zeiss Ikon, Voigtlander and Asahi (Pentax) cameras but not entirely. Most of these are reangefinders and most also have some sort of light meter. All are well made with the Zeiss Ikon and Voigtlander being solid and heavy. Most of these look as good as new. The third theme are currently Olympus, Pentax and Canon cameras but I am not restricting myself to just those. As well as the themes, I insist that the cameras are usable – which rules out any plate cameras and cameras using the many defunct roll film sizes. One of the strangest things about camera development in the 20th century is the gay abandon with which kodak invented new film formats. I also insist that the cameras are aesthetically pleasing, so no Ansco cameras and no Polaroid cameras. Also, I am not keen on dings and bends but I do not mind wear and tear so long as the camera is still usable. The cameras described in these blog posts are actual cameras that I own. The descriptions I give are of the actual camera in my hand. Yes, I do some Interweb research and include some of my findings in my posts but I am clear when I am doing that. Where my description differs from the description of the same camera elsewhere, there are two reasons. Firstly, cameras came with variations, not all of them documented. For instance, Braun used soft changes when updating the Paxette range of cameras. That means there are many intermediate Paxettes between model 1 and model 2 – the original parts were used until they were all gone, then the new part was used. As the various parts ran out at different times, they were replaced with new designs at different times. Secondly, many people research on the Interweb and quote what they find as being the immutable truth. One person makes a mistake on the Interweb and many mindlessly repeat that mistake. On the other hand, the mistakes in my posts are mine and mine alone.